maribo: Are Caribbean coral reefs on the verge of collapse? Are Caribbean coral reefs on the verge of collapse? Coral reefs in the Caribbean certainly are, in a mean sense, in a serious state of decline. The presentation of the data in the Guardian, however, could lead to confusion. 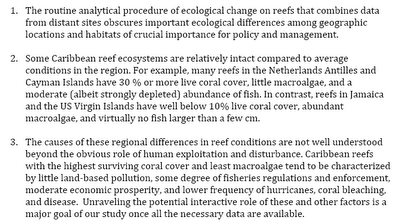 The data is based on the preliminary report (pdf) of a Global Coral Reef Monitoring Network (GCRMN) workshop held earlier this year. The graph at right, taken from the report shows the decline in "percent coral cover" averaged across all reefs with observations in the GCRMN data (black) and an earlier study by Gardner et al. 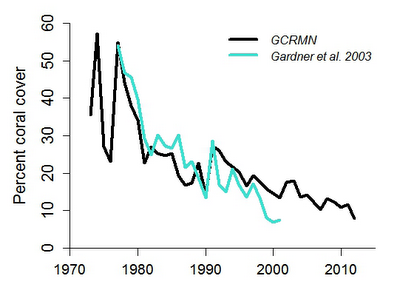 The percent cover dips to ~8% at the end of the longer GCRMN dataset. 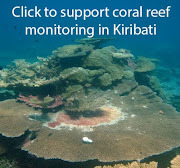 That means that the average percent coral cover at the reef sites in the dataset is 8%. It does not mean that less than 8% of reefs had any live corals. This two statements are the difference between the optimist saying glass is half-full and a mistaken pessimist saying only half of the glasses have any water at all. If less than 8% of the reefs in the Caribbean featured any live coral, then Caribbean coral reefs would not be on the verge of collapse. They would have already collapsed. 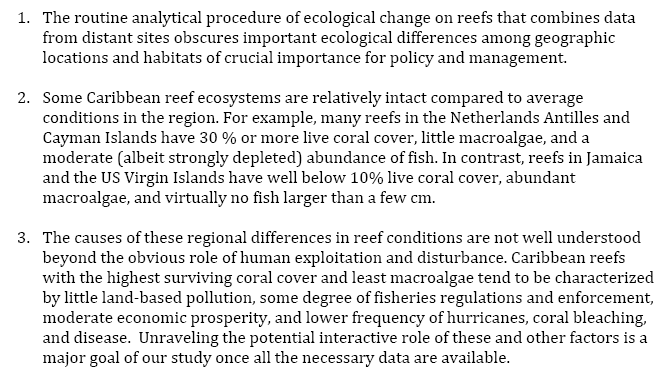 The first two points stress that the status of coral reefs varies greatly across the Caribbean, from the relatively high cover reefs of the Cayman Islands to the lower cover in places like the US Virgin Islands, which were affected by recent bleaching events. The headline should be that "some" Caribbean coral reefs appear to be on the verge of collapse. This matters. The sites that have bucked the downward trend just might be able to teach us something about how coral reef resilience to climate change and local disturbance, and maybe even give us some insight into management and marine park design. That's point #3, and the one of the major inspirations for doing this type of analysis in the first place. Posted by Unknown at 9:30 a.m.